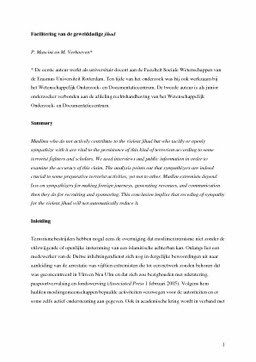 Summary in English<br/> Muslims who do not actively contribute to the violent jihad but who tacitly or openly sympathize with it are vital to the persistence of this kind of terrorism according to some terrorist fighters and scholars. We used interviews and public information in order to examine the accuracy of this claim. The analysis points out that sympathizers are indeed crucial to some preparative terrorist activities, yet not to other. Muslim extremists depend less on sympathizers for making foreign journeys, generating revenues, and communication then they do for recruiting and sponsoring. This conclusion implies that receding of sympathy for the violent jihad will not automatically reduce it.